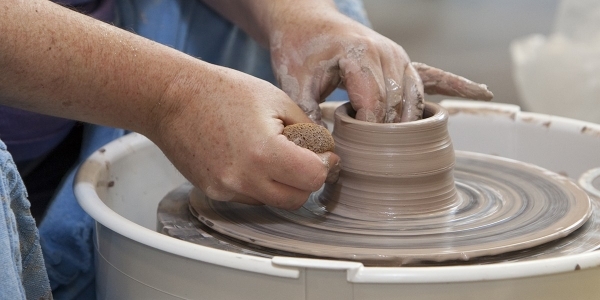 You will be introduced to the fundamental skills of wheel throwing. Wedging, centering, and throwing will be practiced, followed by the basics of trimming. An overview of glazing and decorating will be discussed prior to glazing fired pieces. One Open Studio session is included with the class to complete glazing. Participants will need to return to pick up their finished work. Price includes stoneware clay, firing, and glazes. Laura White has been working with clay for over ten years and is still amazed by how much there is to learn and explore! While in college she practiced all types of hand building, throwing, sculpture and firings. She has taught functional pottery and slab work to adults. Laura has her own line of work and sells it at farmer’s markets and craft fairs.